The La Peregrina Pearl, the Mother of All Pearls! 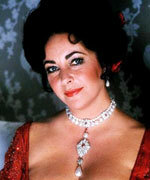 The La Peregrina Pearl is a more than 200 grains natural pear-shaped pearl currently owned by Elizabeth Taylor. A slave supposedly found the pearl in the early 1500s in the Gulf of Panama. In 1554, Prince Phillip II of Spain gave it to Mary Tudor, Queen of England, at their wedding. However, while she was enamored of the Spaniard, he was less than enthused about her or her looks and left for an extended trip to his motherland. She died four years later and the pearl went back to Phillip who went on to create an incestuous clan. La Peregrina stayed with Phillip’s heirs until the Spanish Hapsburg dynasty collapsed in 1700, a victim of generations of inbreeding. Perhaps not the most cursed on the list, this mother of all pearls should have imparted a little wisdom instead of dumb lust to Phillip and his heirs. It's impossible to say whether any of these gems are really cursed, or whether their owners have simply met with a series of unfortunate accidents, some possibly brought on by the belief that the gems actually were cursed, a case of self-fulfilling prophecy. The only thing that can be known is that while these gems are beautiful to behold, their histories indicate that being associated with them can be hazardous to one's health, and should inspire anyone thinking of acquiring them to think twice before doing so.